The Executive Committee meeting of the European University Sports Association (EUSA) was held on April 6, 2017, in Coimbra, Portugal - the host city of the European Universities Games 2018. The meeting was held a day before the start of the EUSA Conference and Gala 2017. EUSA Executive Committee members, staff and invited guests were greeted and welcomed by the President of the Portuguese University Sports Federation (FADU) Mr Daniel Monteiro who expressed the satisfaction of FADU and himself to be able to host the meeting, working together in the preparation of the Conference and Gala this April, European Universities Championships which will be hosted in Portugal this summer, and especially creating together the European Universities Games Coimbra 2018. EUSA President Mr Adam Roczek thanked the hosts and opened the meeting. Together with EUSA Secretary General Mr Matjaz Pecovnik they gave an overview of activities in EUSA, focusing on the report from the last meeting, and presenting an activity plan for the future period. Financial aspects, including the detailed accounts, were presented by EUSA Treasurer Mr Lorenz Ursprung, who also presented the 2017 provisional budget. The financial report was followed by the Auditors’ Report, presented by Mr Liviu Matac, one of the EUSA Auditors, sharing the outcomes of annual review and audit which was done in March. Sport events were a big focus of the meeting, with EUSA Sports Manager Mr Besim Aliti first presenting the progress report of this years' European Universities Championships and EUSA endorsed events. Together with Secretary General and Supervision Commission members, internal report of the European Universities Games 2018 and 2020 was also presented. The Organising Committee, lead by Mr Mario Santos, Secretary General, presented their progress report, providing general, as well as more specific information and planning of the European Universities Games, which will be hosted in Coimbra in July 2018. Section on sports events also presented the open bidding procedure for the next two editions of the European Universities Games. EUSA members are invited to announce letters of intention by May 15 this year to host the 6th and 7th edition of the EUSA Games in 2022 and 2024, respectively. Projects with EUSA participation and partnership were presented next. First, EUSA Secretary General Mr Pecovnik presented the projects supported by the International University Sports Federation (FISU) and gave an introduction to other projects. EUSA Communications and Projects Manager Mr Andrej Pisl presented the projects which are supported by the European Union through the Erasmus+ programme; starting with the European Week of Sport and #beactive campaign, conclusion of SCORE project on gender equality; report on VOICE project on the prevention of sexual violence and harassment, and gave an overview of project proposals for future projects. Ms Sara Rozman, EUSA Education and Development manager, gave a report of EUSA Conferences and Meetings, focusing on the upcoming EUSA Conference and Gala 2017. Under the title of Fostering Inclusion and Well-Being through Sport, in two days of plenary sessions and workshops, over 120 participants will take part in this bi-annual event. 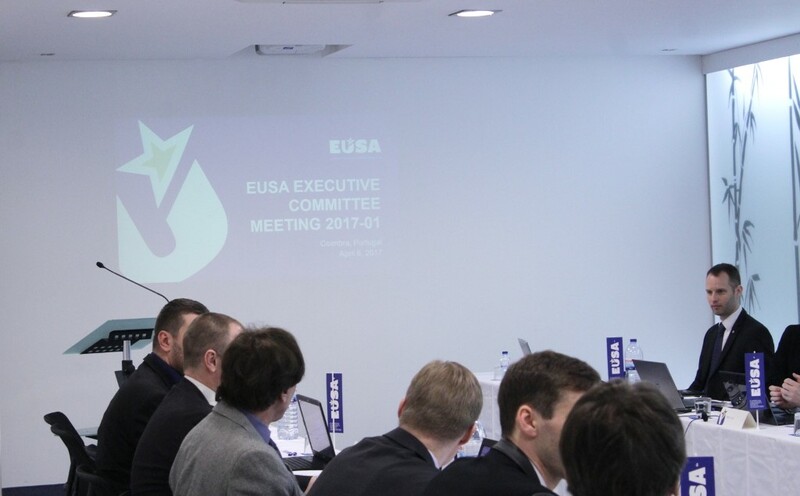 An update on the next year's EUSA General Assembly, which will be held in Madrid in April 2018, and on the FISU-EUSA Seminar, which will take place for the first time in Europe in December this year in Ljubljana, concluded the part on conferences and meetings. Executive Committee members also discussed international cooperation, focusing on FISU and Continental university sport federations, partner organisations and institutions, including the European Commission, and other organisations. EUSA Executive Committee is happy to join new partnerships and memorandums of understandings with several sports governing bodies on European level are to be signed soon. Chairs of the EUSA Commissions presented the reports on the activities of the Commissions which started their meetings, including Rules and Regulations Commission, chaired by EUSA President Mr Roczek; Student Commission, chaired by Ms Anna Edes; Medical Commission, chaired by Ms Abosede Ajayi; with Media and Communications Commission, chaired by Mr Bill Thompson. The meeting concluded with the report of the EUSA Institute and review of the upcoming meetings. Next EC meeting will be held in September in Tartu, Estonia, between September 20 and 23, covering the International Day of University Sport (IDUS) on September 20 and the launch of the European Week of Sport on September 23. EUSA Executive Committee members will attend the EUSA Conference over the next two days, also hosted in Coimbra.